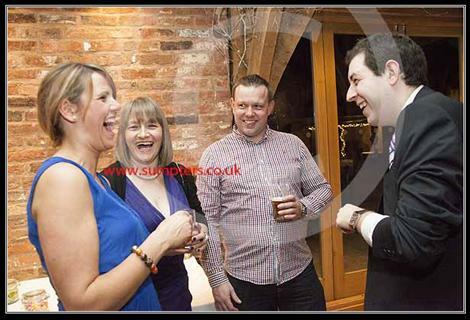 Every year Award Winning magician Alex Michael performs at many weddings in Nottingham and around the UK. Be it a small intimate wedding at a house with 20 guests or a large castle with 1000 guests, Alex is a superb addition to any wedding. He is guaranteed to add the wow factor and leave your guests completely amazed. Alex is flexible with his performance style, either at tables or standing mingling with your guests amazing them with his magic. His magic includes tricks with cards, coins, borrowed money and many borrowed items. It is a great ice breaker and conversation starter for any guests who may not know each other. Having Alex perform at your wedding is ideal during any lulls in the day e.g. when photographs are being taken or if the room is being ‘turned around’ and more guests are arriving. Wedding magician Nottingham – Unfortunately Alex does not attend wedding Fairs as he is usually busy performing at weddings but he will be more than happy to meet with you to discuss your requirements and of course show you some magic. If you are having a wedding with children present, no problem at all, Alex can perform ‘child friendly’ magic and make them balloon models to keep them entertained as well. Alex is fully insured and CRB checked and can offered hundreds of great references.